We used to frequent ‘The Pier’ as a newly married couple. My husband was a great dancer, he loved dancing. We used to sit out the back in one of the alcoves that the courting couples used, over looking the lighthouse and beach. It was lovely a real nice spot. That was 60 years ago!! 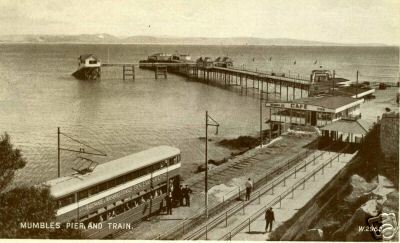 Mumbles Tram pulling into the station in the 50’s. I remember visiting the Pier in 1957 with my 5 year old cousin and I lost him the Amusements (Gareth Pye), he was a bright boy and he found his way home via the Mumbles Train! And was back in Egan Crescent, Townhill (with the help of the train driver aand the bus driver – free travel!) Sadly he is not with us anymore, but memories live on. I am hgere with my mother Joan at the moment.